This afternoon I saw three of the six species of woodpecker we have here. I was sitting quietly in the wood while the sheep browsed, when a Pileated Woodpecker swooped right in front of me and landed in a nearby tree. Pileated Woodpecker, Dryocopus pileatus. I had the camera on automatic and it chose shutter speed 1/160, f/5.6, ISO 250. These birds are huge, actually about the size of some ducks, such as Cinnamon Teal or Ring-necked Ducks. This first time I ever saw one was probably ten years ago, at Brazos Bend State Park (which is an amazing place to see birds and alligators). I had no idea what it was, and kept trying to get close enough to really see it. It seemed not to notice me, but every time I would get a clear view without tree trunks in my way, it would take off and fly a good distance away, and I ended up following it for half an hour without getting a good look. Here on the farm, I hear them all the time and see them often, but they are very camera shy. The only close pictures I have gotten have been when they explore a tree stump in the yard, and can’t see me inside the house, but then the glass and window screen ruin any clarity. This is the best picture I have gotten of one. Right after that, a small woodpecker flew to a tree on the opposite side of me, and started climbing. 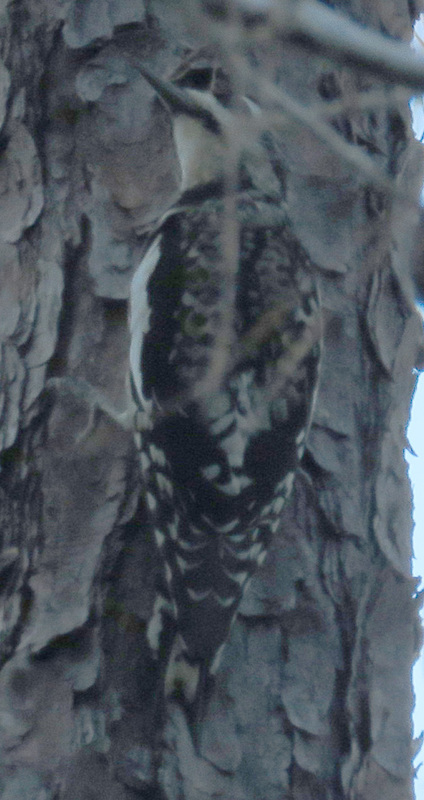 I thought it was a Downy Woodpecker, and aimed my camera. The whole shot looked dark, until I had zoomed in just on the woodpecker and tree trunk, excluding the pine needles and sky. Then the camera’s automatic metering compensated for the shadows and the bird showed up better. Yellow-bellied Sapsucker with a slightly blurry head. The camera chose shutter speed 1/125, f/5.6, ISO 160. 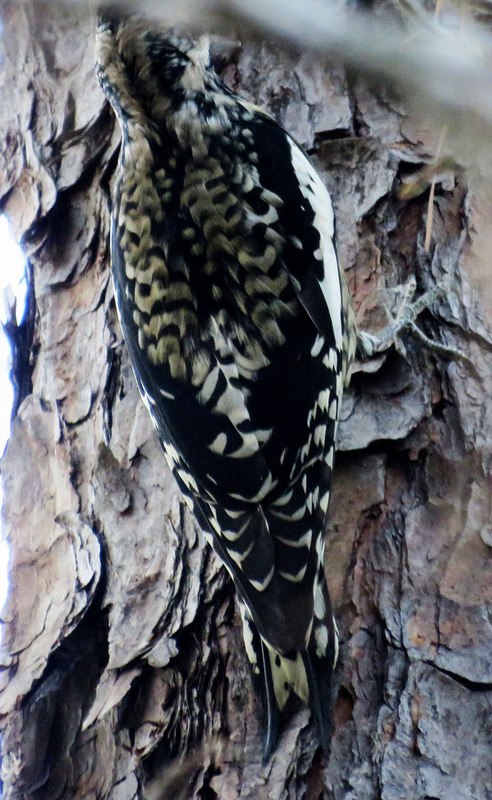 It was a Yellow-bellied Sapsucker! They are only here in winter, and it is still hot outside, we have not gotten a cool front yet, so I was surprised to see it. Between its moving its head around, and a branch in the way, I didn’t get a good picture of its head. There should be a patch of red on top, but in the shadows that can be hard to see, or possibly this bird is not fully mature. I had never seen the beautiful patterning on its back so well before. Sphyrapicus varius. These camera settings did a better job of showing contrast: shutter speed 1/60, f/6.5, ISO 800. 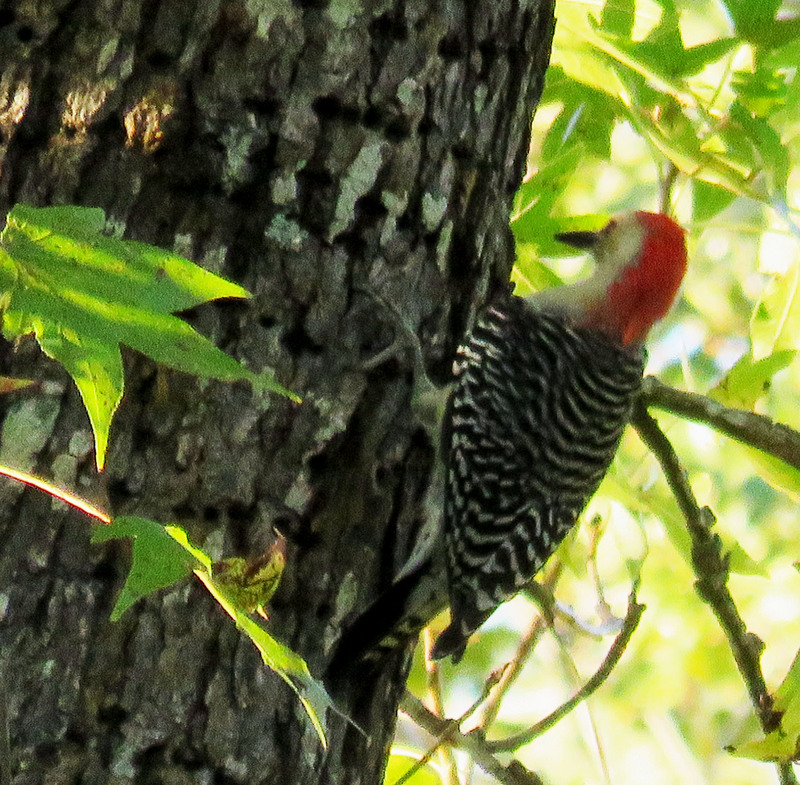 Red-bellied Woodpecker, Melanerpes carolinus on a sweet gum tree. Camera settings were shutter speed 1/160, f/6.5, ISO 500. The great thing about this picture, is that the bird is making use of holes drilled by a sapsucker. Sapsuckers drill holes in neat rows, a few inches apart, and you can see how long they must have worked on this tree. They can drink the sap that oozes out, and eat insects that are attracted to the sap too. Those holes look pretty old, so I’m not sure what the Red-bellied is after there, but he flew right to it as if he was after something in particular. You can also see how he relies on the stiff tail feathers to support him as he hops around the tree. A nice batch of birds! Until I started travelling my only image of a woodpecker was Woody Woodpecker in the cartoons. I got a huge thrill when I was in central America and heard the tap tap tapping and spotted a woodpecker. I think it was a Pilelated one, looking at your picture. I got a couple of snaps. Nowhere near as good as yours! I must go through my shots and find them and figure out where I saw Woody!. Thanks for bringing back that memory. Yeah, when I was a kid I only knew Red-headed woodpeckers, and couldn’t figure out why the cartoonists made Woody look so weird! Now I think they were trying to illustrate a Pileated, because they do make a laughing sound very similar to his. I don’t know much about bird in Central America, but it may be a different species yet. I hope you find your pictures and remember where you were! They are so hard to photograph. When I go out, I have some sheep and dogs with me, and I think the birds forget there is a human with them, and sometimes they get pretty close. I found the picture. It was in Tikal, Guatemala. Definitely has a red head. Not sure if it is the same as yours though. Cool! 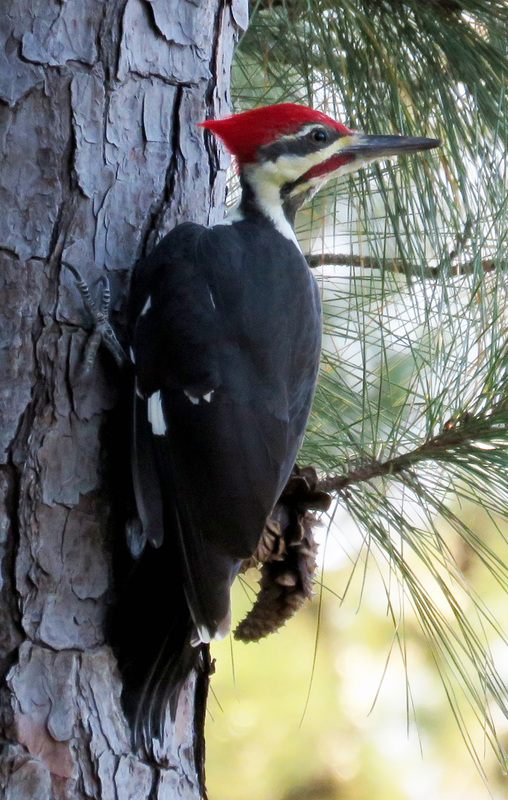 That photo of the pileated woodpecker is great–so regal!